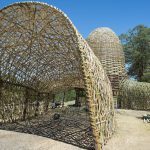 “Vietnamese architect Vo Trong Nghia is continuing his bid to make bamboo “the green steel of the 21st century” with this gridded pavilion at the Sherman Contemporary Art Foundation in Sydney. These ladders were manufactured in Vietnam before being transported to Australia. A process that involved treating the bamboo in natural waterways for two month, then subjecting it to a month of fire smoke. The ladders are bound together with string, creating a regular grid that supports a series of woven, rectilinear baskets. These are filled with an assortment of plants and shrubs. A series of openings invite visitors to walk or crawl amongst the baskets, while transparent plastic provides a sheltering canopy overhead.